Update 2016: Iguana Cave has now been closed to the general public. Tours can be arranged with Mr. Oliver Hodge. For more information, call: 264-584-8712 or 264-584-8713. For more on what to expect inside this cave and the incredible underground cave, Katouche Cave, read more on Pure Anguilla who offers tours of both. I call this story the "Anguilla.com Indiana Jones Video Game." It all started when Claire Devener, Publisher and Editor-in-Chief of Anguilla Life magazine, called and asked if we would like to visit Iguana Cave. Since I am neither fond of iguanas nor caves, my first instinct was to say "NO!" But my dad, of course, said "Sure." 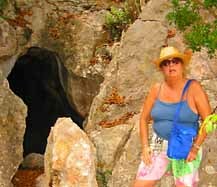 Claire recommended that we hike to the cave from below, via Katouche Bay, which is an approach that you will not read about in any Anguilla tourist book. 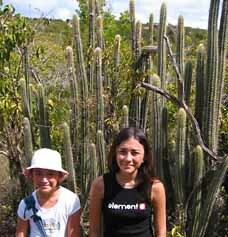 It takes you through Anguilla's only rain forest, and as you will see, into quite an interesting journey. So off we went, the Indiana Jones Evoy and Claire players, into the Anguilla.com video game. ... tracing our way around the lake... the dried up lake... was there quicksand there, or was that just my imagination? 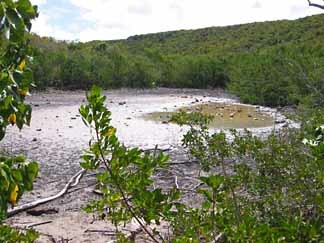 Once we were safe of the man-eating pond, the foliage turned into Anguilla's only rain forest, humid for the first time. We could hear (poisonous?) lizards scamper through the jungle, and startled birds fluttered through the trees. Exotic beautiful plants, seen nowhere else in Anguilla, were everywhere... Bromeliads! 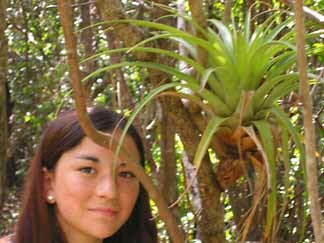 These plants can only survive in rainforest type climates. Claire told us that before Hurricane Luis (1995), the trail had been much more rainforest-like, but Luis devastated the area. Still, it was clearly growing back. After a good 10-15 minutes of steady, uphill hiking, we came to another fork. But the intreprid players were confused this time. Right or left? We started left, but became tired and doubtful. We sent a scout ahead, my Dad. The path turned into a dried-out river bed and then came to a dead-end in a canyon, he said. We all carefully tred back down the hill, and this time continued on the right fork. The uphill path came to an ancient, steep stone staircase... an old rocky stairway perhaps created by the original Arawak Indians? The ARAWAK ROCKY STAIRS went on and on. It was hot, it was now dusty, cacti starting to appear, our thirst increasing. Still our trusty Anguilla.com action figures plodded ahead fearlessly (almost!). We kept going and going, no matter how steep the stairs, no matter how dangerous the mission! We all sensed that we were getting close when rows and rows of hundreds of cacti began appearing. It felt as if they were guarding something. The Sentinel Cacti continued getting bigger and bigger. The Arawka Stairs wound to the right, as steep as ever. Our Indiana Jones brigarde kept on mounting the stairs, passing more and more cacti. We thought we would hike forever, perhaps never reach the cave. Claire led the way. The cave looked so dangerous, but she went ahead anyway, hungry for adventure! The rest of us were close behind. Surprisingly, the cave's interior was not dark and scary, as we had anticipated! There was light inside! Were there occupants? Carefully, we walked ahead, into the cave, careful not to trigger the sleeping (vampire?) bats. We headed towards the light. And there it was... the sun was shining in, radiating down from a hole high above. 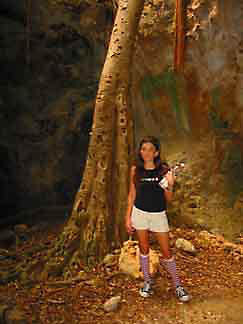 And finally, we found the TREE TREASURE that Claire had told us about... a magnificent tree growing in the middle of the cave, up and through the hole. The cave went on and on, and grew darker. However, we figured that we had used up our last ounce of good luck to survive this far! (And we didn't have a flashlight!). GAME OVER! We turned around, and headed back to the beach. It was a long walk back, but a lot easier, with a sense of accomplishment lightening our steps, not to mention the downhill course during our return. We all made it back, alive, to the beach... the Anguilla.com video game players had won!